Millennium Rehabilitation’s board-certified Athletic Trainers, providers of athletic training and sports medicine services to Highland Local Schools from 2002 to 2016, are experts on and off the field. Offering rehabilitative and restorative care to communities’ athletes, Millennium Rehabilitation is a highly credentialed “direct access” provider of physical therapy – no doctor referral required to obtain physical therapies for sports injuries, work injuries or other chronic physical pain. Events covered include, and are not limited to, all boys’ and girls’ OHSAA sports. Our staff also includes a credentialed provider through the Bureau of Worker’s Compensation. 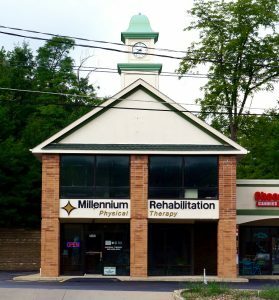 With a full staff and flexible work schedules, Millennium Rehabilitation has the capabilities to provide athletic training services to neighboring communities. For any sporting event which calls for athletic training coverage, Millennium Rehabilitation is the ideal provider of “on call” Board-Certified Athletic Trainers. Elevate your event’s safety and credibility by providing Board-Certified Athletic Trainers to oversee participants’ potential sports injury needs.